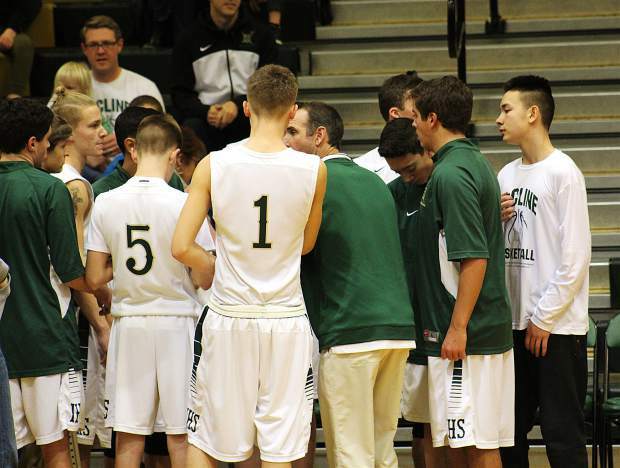 The IHS varsity boys basketball team discusses strategy during a game this past season. INCLINE VILLAGE, Nev. — The Incline High School boys varsity basketball team survived the most interesting season head coach Tim Kelly can remember with a 10-15 record overall, 7-7 in AA league play and its 5th straight trip to the regional tournament. “We had seven rescheduled games because of snow,” Kelly said. “Our starting point guard missed the second half of league play due to a concussion and our starting big man became ineligible at the semester and we still found a way to finish as the 4th best team in our conference and compete at regionals. The Highlanders started the season with a very inexperienced squad, with only two returning varsity players from 2015-2016. They had five sophomores, 2 juniors and four seniors who were untested, and they had no idea who their leader was going to be on and off the court. They found out quickly that all 11 of these young men were ready to compete to the best of their abilities — and they found out right away that one young man was ready to lead. “Our five sophomores aren’t regular underclassmen,” Kelly said. “They have been preparing for this since they were in 6th grade. They showed our league that we are going to be very good for the next two years. Our seniors gave us more than I could ever have imagined this year; they played extremely hard and accepted their roles to perfection. They are an awesome example of what Incline basketball is all about. Stranzl was definitely the leader for the Highlanders. Already a co-captain with senior Jeremy Goldberg, Stranzl, the second-year varsity player, averaged 17.9 points a game in league play, including a 33-point outburst at Battle Mountain. Stranzl was awarded First Team All Conference from the conference coaches. While Stranzl was doing his thing, sophomore Ian Smith erupted as the second big threat for Incline. The MVP of the JV team in 2016, Smith averaged over 12 points a game in league while hitting over 70 three point shots in 14 games. He single-handedly saved the Highlanders, and their season, in their season finale at North Tahoe with a gigantic 18-point performance. That game propelled Incline to the regional playoffs. For his efforts, Smith was named Honorable Mention All Conference. “Those two guys were very good this year, but the effort of our whole team is what I’m extremely proud of,” Kelly said. “Jeremy Goldberg, Devyn Sutton, Conor Nix and Christian Rodriguez were amazing seniors. Kevin Duffield was huge for us as a junior, and Liam Nolan-Bowers, Matthew Cornell, Jackson Littleton and Johnny Redfern had an awesome season for sophomores.